Insulating domestic hot water pipes is one of the easiest and most cost effective measures you can do. The cost of this pipe insulation is only $0.30 per foot. Savings will depend on heating fuel (see below), but in all cases the payback is well within one year. 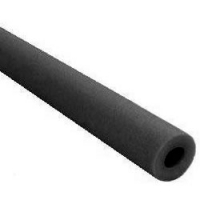 Tube pipe insulation may be used on domestic cold and hot water pipes. Pipe insulation will help to reduce heat loss by up to 80 percent through hot water pipes and will stop sweating on cold water pipes. Pipe insulation can also help reduce plumbing noise. It is pre-slit for easy installation (simply snapping onto the pipe), and may be trimmed with a utility knife. One package includes four 3ft long pieces, with this 5/8 inch wall thickness tube suitable for use on 3/4" copper tubing, 1/2" PVC pipe, and 1/2" steel pipe.